We recommend rather to follow Tutorial: Object detection and localization that is based on vpMbGenericTracker. You are advised to read the following tutorials Tutorial: Markerless model-based tracking (deprecated) and Tutorial: Keypoints matching if you are not aware of these concepts. The corresponding code is available in tutorial-detection-object-mbt-deprecated.cpp. 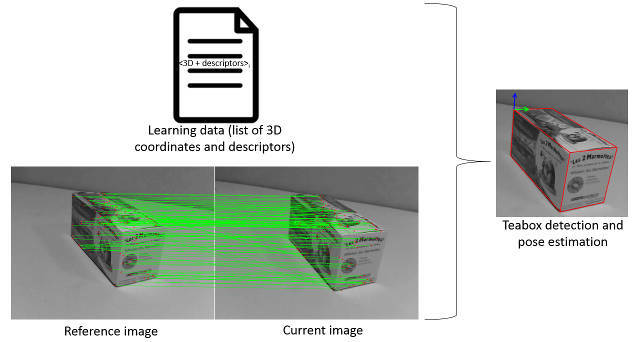 It contains the different steps to learn the teabox object on one image (the first image of the video) and then detect and get the pose of the teabox in the rest of the video. The pose of the detected object can then be used to initialize a tracker automatically rather then using a human initialization; see Tutorial: Markerless model-based tracking (deprecated) and Tutorial: Template tracking. The corresponding source code is given in tutorial-detection-object-mbt2-deprecated.cpp. If you have a look on this file you will find the following.